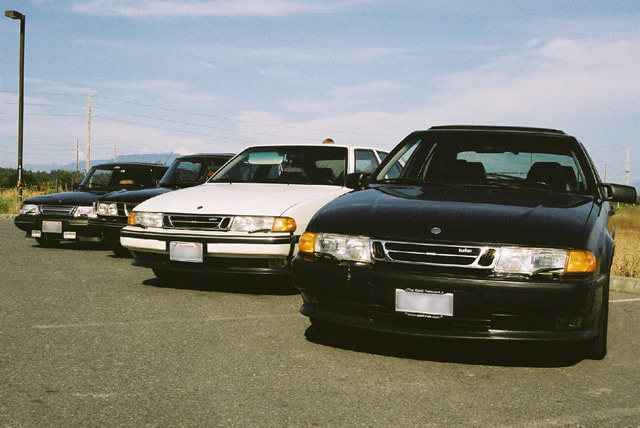 SaabKen started the Saab Club of Western Canada (SCWC) listgroup in summer of 2002 to facilitate a common meeting place for western Canadian Saab owners of all models. SCWC is currently very active with over 20 members and always welcomes new local enthusiasts to join. 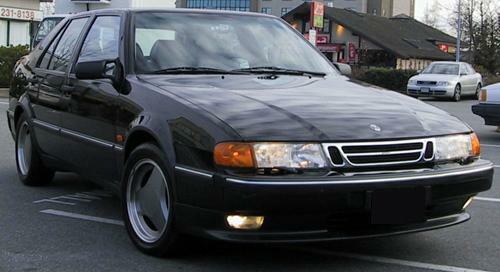 This is SaabKen's 1993 9000 CSET auto, Matilda, which lives in Vancouver, BC, Canada. Currently, she has covered a total of 176,000 Km. Here, Matilda (right) leads a lineup of four fine Saabs during a fun run to Whidbey Island in the central Puget Sound area of Washington state in August 2002. The local club in Seattle is Saab Club of Seattle. Next to Matilda are (right to left) a white '93 9000CSET, a late 70's 99T, and a '93 900SPGT. Click on the photo for a larger version.